Today I’m sharing The Best Chicken Tortilla Soup Recipe I’ve ever made. Drop your dinner plans and make it tonight! I have a small scar between my eyes. It’s a pock-mark really. Only the most attentive surveyor would notice it, but I notice. Every day. I went to a skin clinic to consider having it removed. The doctor told me that 3 simple laser treatments would render my little indentation obsolete. That’s right, for less than $250 a scar-free face! I went home to think about it, and had a mini-revelation. Scars are a sign of healing and growth. Every scar we have represents a life lesson. The pock-mark between my eyes was a valuable lesson to a nine-year-old, to not hold a parakeet so close to your face when you’re sick with the chickenpox! The marks on my forearm represent an education in keeping my elbows up when I reach into the oven. The crater of my ankle cautions me to wear long pants when walking through thick barbed-wire laden fields. The tiny slash on my finger prompts me to keep my fingers curled back while chopping carrots for something like The Best Chicken Tortilla Soup Recipe. These lessons are all branded on my body, and therefore all branded in my mind. Thinking about this made me realize, internal scars are the same. We’ve all been wounded by loved ones, harsh realities, and disappointments. Yet as long as these wounds don’t remain open… As long as we allow them to heal (not fester) we are showing signs of growth. We are becoming stronger and healthier. We are developing character. I have scars from people in my past, that act as tokens of how to handle future relationships. I have scars from being overlooked for promotion, that produced a deeper work ethic. There are even scars I’ve inflicted on myself that now stand as a memento to hold and protect a healthy self-image. They are all symbols of maturity and therefore utterly priceless. So I think I’m going to keep it my little pock-mark. I now look at a scar as a thing of beauty. As For The Best Chicken Tortilla Soup Recipe? It would seem that everyone has their own version of chicken tortilla soup. Some are thick like gravy. Some thin and watery. I prefer a thin, but not watery, broth-based chicken tortilla soup with lots of veggies and toppings. 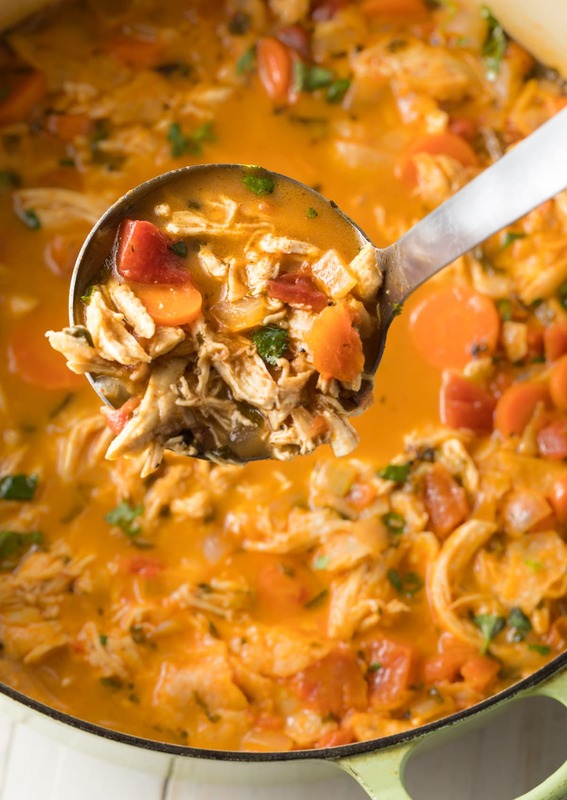 I developed this easy chicken tortilla soup recipe years ago and would venture to say it is my most requested recipe, both with personal friends and blog readers. 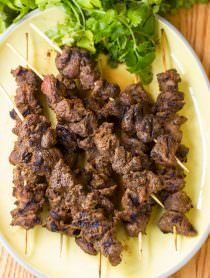 I email the link to this recipe constantly! It’s chunky, perfectly spiced, and so quick to make. 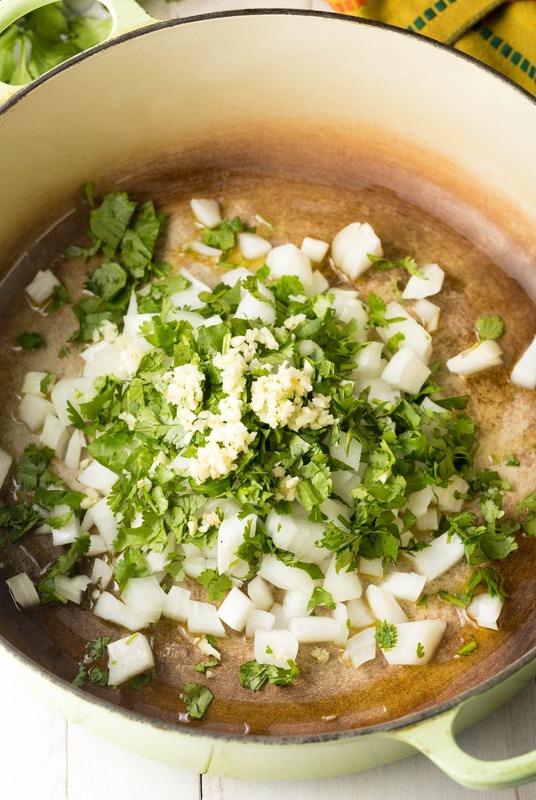 The deep rich essence of the broth comes from sautéing the onions, garlic, and cilantro to release their flavor, before adding the broth and spices. Then cheese and crushed tortilla chips are added at the end to thicken the soup base and give it a comforting luxurious feel. 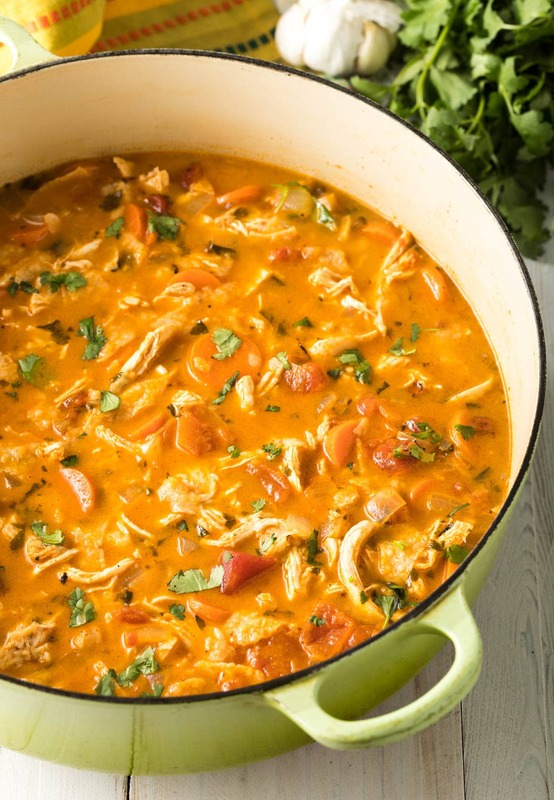 You are going to love this chicken tortilla soup! What will you need to make this zesty tortilla soup? It only requires 15 simple ingredients… 10 of which are pantry staples! Onion – The beginning of every great soup recipe. Cilantro – If you don’t love raw cilantro, you may still enjoy this soup, because the cilantro is well-cooked. Garlic – Fresh is best! 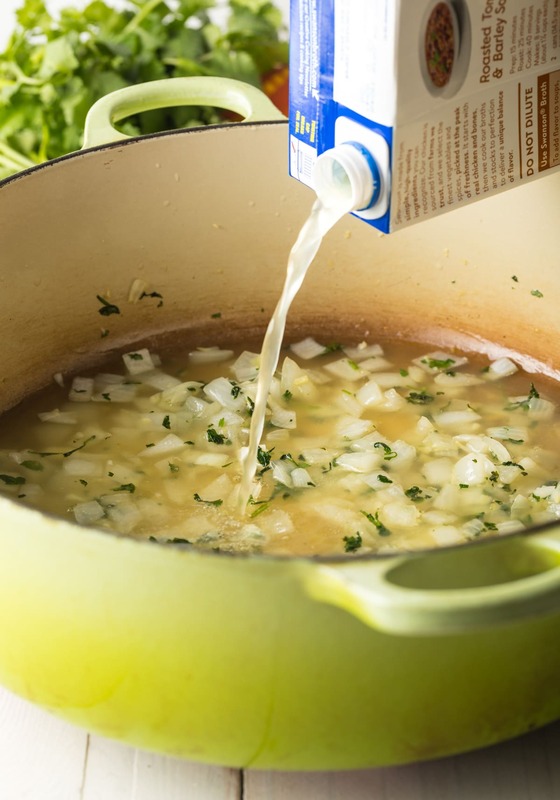 Chicken broth – Use your favorite brand. 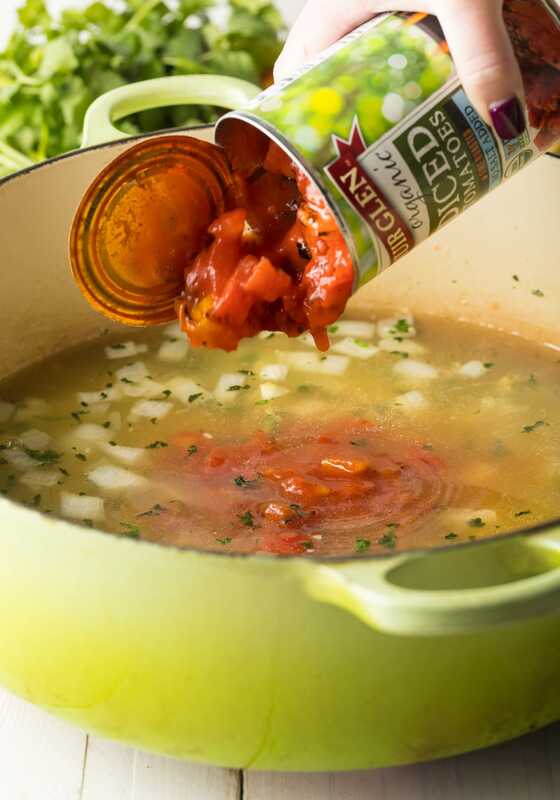 Diced tomatoes – Look for a brand of canned tomatoes that offers “fired roasted” for extra flavor. 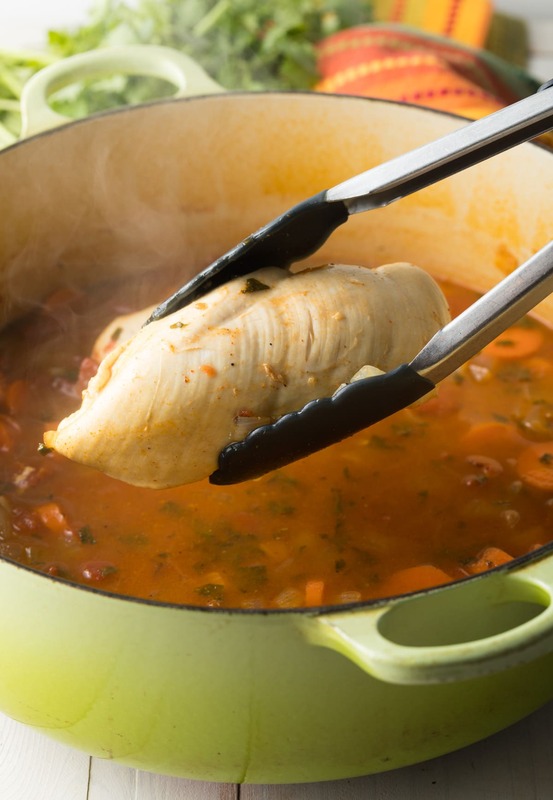 Chicken breasts – Cook them whole, right in the broth. Ground cumin – For deep smoky essence. Chili powder – Or pure ground chiles. Cayenne pepper – For a little kick! Bay leaves – For a deep herbaceous note. Carrots – If the skins aren’t rough and fuzzy, there’s no need to peel the carrots. Avocados – The perfect creamy topper. Bag of tortilla chips – To thicken the soup and to add as a crunchy topping! In a large stock pot, add the onions, cilantro, and garlic. Sauté to soften. Stir in chicken broth, tomatoes, whole raw chicken breasts, and spices. Push the chicken breasts to the bottom of the pot and bring to a boil. Add the carrots, and simmer until the carrots and chicken breasts are cooked through. Shred the chicken, then return it to the pot. Stir in cheese and crushed tortilla chips to thicken the broth. Top each bowl with the more cheese, fresh cilantro, fresh avocado, and tortilla chip pieces! 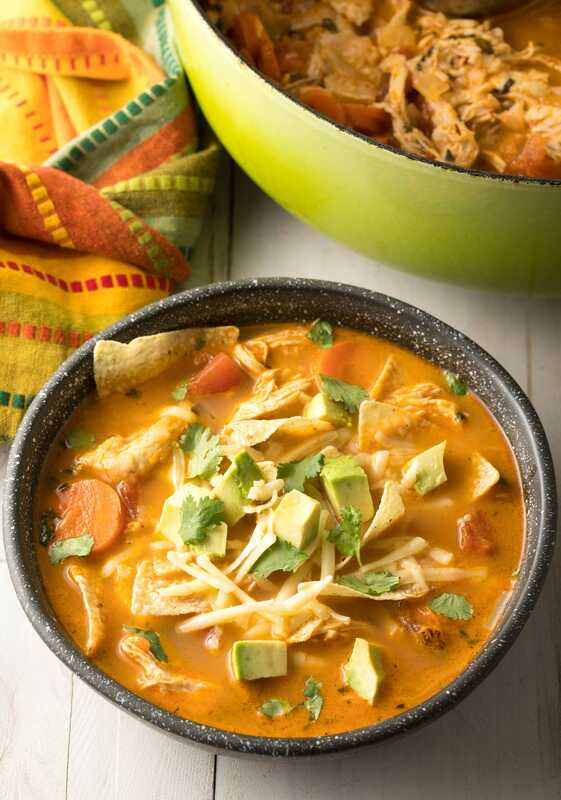 Get the Full (Printable) Easy Chicken Tortilla Soup Recipe Below! Can I Freeze This Chicken Tortilla Soup? Yes. Just be sure to thaw it at room temperature before reheating, to protect the veggies from turning to mush. Can I Skip The Cheese? Yes. The broth will not be as thick and rich, but you will end up with a lighter leaner soup. Can I Make A Low Carb Chicken Tortilla Soup Variation? Yes. Just remove the tortilla chips! Can I Take Out The Cilantro? Yes and no. Yes, you can take out any ingredient, but NO it will not taste the same. I will say, I have served this easy chicken tortilla soup recipe to several cilantro haters, and they loved it. They say the illusive “soapy” taste is removed through the cooking process. Just be sure to leave the fresh cilantro off at the end. 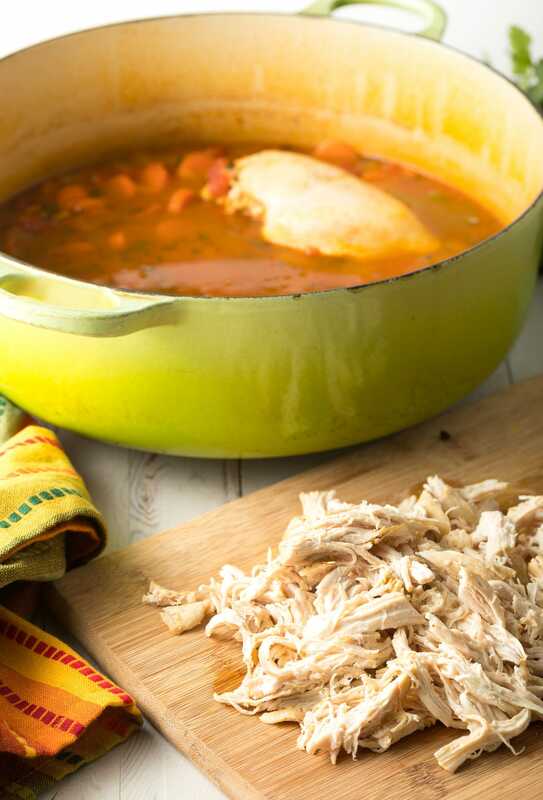 Can I Make This Chicken Tortilla Soup In The Instant Pot? Absolutely! Find the instructions in the recipe notes below. 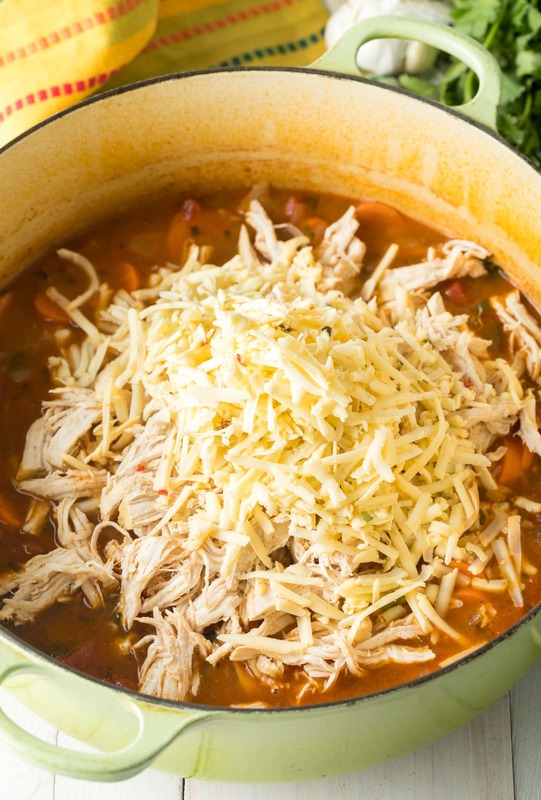 Also try our simple Slow Cooker Chicken Tortilla Soup recipe! The Best Chicken Tortilla Soup Recipe ever! 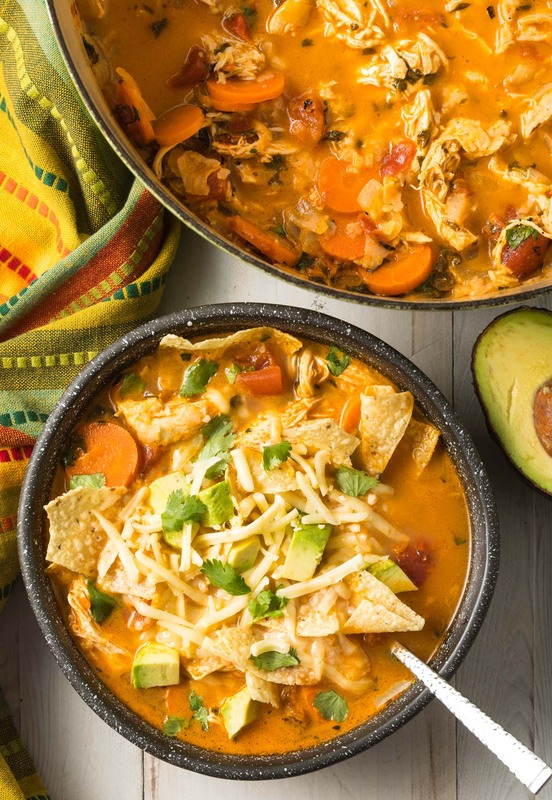 This fresh and healthy tortilla soup recipe is easy to make and an absolute crowd-pleaser. In a large stock pot, heat the oil over medium-high. Add onions, 1/3 cup cilantro, and garlic. Sauté 3 minutes. Stir in chicken broth, tomatoes, whole raw chicken breasts, all the spices, and 3/4 teaspoon salt. Push the chicken breasts to the bottom of the pot. Bring to a boil. Add the carrots. Return to a boil, then reduce the heat to medium and cook another 10-12 minutes. Remove the cooked chicken breasts with tongs and either shred or chop them. Add the chicken pieces back to the soup. Stir in half the cheese and 1 cup crushed tortilla chips. If too much of the broth has evaporated, stir in an additional cup of broth or water. Ladle into bowls and top with the remaining cheese, fresh cilantro, fresh avocado, and more tortilla chip pieces. This is a great recipe to use up leftover chicken or a rotisserie chicken. Just add it in at the very end to warm it up. To make this a “low carb” recipe, omit the tortilla chips. It’s still awesome! Set the IP on Sauté. Add the oil, onions, 1/3 cup cilantro, and garlic. Sauté 3 minutes. Stir in chicken broth, tomatoes, whole raw chicken breasts, carrots, all spices, and 3/4 teaspoon salt. Push the chicken breasts to the bottom of the pot. Lock the lid into place and set on Pressure Cook High for 5 minutes. Perform a Quick Release. Once the steam valve button drops it's safe to open the lid. Remove the cooked chicken breasts with tongs and either shred or chop them. Add the chicken pieces back to the soup. Stir in half the cheese and 1 cup crushed tortilla chips. Excellent recipe! I added 2 cans of black beans and 2 cans of corn. 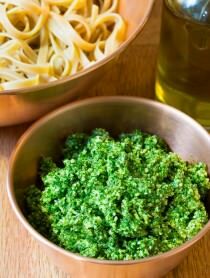 I also substituted parsley for the cilantro. One of my favorite soups! I make this all winter long. This is such an ultimate comfort food! Everyone at my house loved it! Looks great! Very similar to my recipe. Try adding a can of whole kernel corn, drained. As you mentioned, I use a purchased rotisserie chicken, with the cooked meat added at the end. Sure! Just saute the veggies on the stovetop first to get them started. This soup is amazing! So full of flavor! I loved it! I’ve made many tortilla soups over the years, but now this is my new favorite!!! I’ve made this many times, and wanted to let you know how much we love it! On tonight’s menu, and I’ll be using rotisserie chicken for a very fast and satisfying dinner. Many thanks! This is excellent! Wanted a little more veggies, so did add extra carrots, celery, corn and black beans. Wonderful!!!! I love this chicken tortilla soup broth, and it smells amazing! Glad you posted it on you FB page :). Going to make this tonight, have all of the ingredients gathered and its a perfect overcast day for some tortilla soup! Will post about how it turns out. Wish me luck!!! That soup is fantastic! Will make again. I prefer my childhood scars to my adult scars, lol..but with a bowl of this goregous soup, my scars would quickly fade..great recipe! LOVE your gorgeous soup and how I know it will stick to my ribs. It’s been raining continuously for about 28 straight hours now, I’m shivering in my robe and slippers and I tell you, I could really use a bowl of it right NOW!! Hey, this soup looks awesome. I love the step by step photos-they are so enticing. Plus, they make me want your Le Creuset looking Cauldron (smile). Ooh, and that bottom photo is killer by the way. Just lovely! I love chicken tortilla soup but have never made it myself. Yours looks so delicious that I think its time I tried! Btw, you won my Isaly’s giveaway! Congratulations! Please send me your address at [email protected] so I canget that out to you! I like your story. I have tiny scars due to a little illness inside my arm. When they were fresh I was really mad about it, I didn’t wear short sleeves that year, I even had sorts of gloves. I had to wait before I could have them removed. Later when the dermatologist reminded me I planned to do the laser, I said : ” NO ! I keep them.”. They are now part of me and whenever I see them, they remind me of the holidays with friends when I was hiding my arm. A scrummy soup & great meal idea! Don’t cut yourself short. This is totally famous:) Great reminder that our scars are our testimony. Our proof that we are living. Great post! I loved the look of your new website- awesome!The dish looks tasty and delicious..
Great job, this looks SO good! I can see why it’s a requested recipe — it looks delicious! I’m not a big soup person but I really like tortilla soup. Yours looks fab. wow, the recipe looks great, and love your reflections on the scars that make us who we are. very thought-provoking. thx! Sommer, the soup looks so comforting, that I wish I could have a large bowl right now! Love your photos! The soup looks so vibrant and alive. You are using my green pot, again! I can feel some warm shivers of motivation coming on, here! 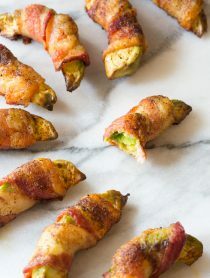 I will be putting this recipe on my to make list and you just may find yourself headlining my site someday soon… depending on how fast I get my act together. This sounds YUMMY and your photographs as to PERFECT and quietly sophisticated, thoughtful, elegant and definitely celebrate the fresh ingredients used to make this dish. Big hug to you today. I think scars rock. Now internal scars…not so much. But they are lessons learned. Great post Sommer. Even better SOUP! This looks fabulous! I had just printed off another Chicken Tortilla Soup to try when you posted yours. So tonight I tried your recipe and it is definitely a winner. We loved every flavor and it tasted so fresh. Thanks Sommer…this soup is definitely a winner and so easy to make. I loooove tortilla soup! However, I’ve never actually made it at home! Your version looks so delicious, and I love all the toppings, too. Oh Laura, I’m so glad you liked it! Last night I tweeted about my “nearly famous” soup and several local friends responded that it was famous in our circle. TWO different families reported they were actually having it for dinner last night! Scars are memories too! The soup sounds fab. Great photos! The tortilla soup looks incredible – I love the variety that you’ve used and the result of a colorful, flavorful meal. Your chicken tortilla soup is super delicious, plus gorgeous presentation too! this looks so hearty and yummy. it reminds me of the chicken tortilla soup that I had at Yardhouse. What a great reflection…I love how you moved from bodily scars to internal scars. Very poignant! And then of course, this soup looks amazing! I love all the fresh ingredients…the chips…the avocado. Too good! And the wrinkles starting to appear on my face are laugh lines! Well, that’s what I tell myself! I’m not a soup fan, but I ADORE chicken tortilla soup. I think it’s because of all the fixings. “God will not look you over for medals degrees or diplomas, but for scars”. Tortilla soup is one of my favorites. Beautiful photos. Yum!! That looks amazing! One of my favorites! I know tortilla soup is such a popular recipe, but whenever I see pictures of it, it looks so bland and unappealing! Not the case with yours!! I can’t wait to print this out and try it! We love Mexican Chez Hound! Every wrinkle and and every mark inside and outside of my body represents an experience to me as well, good or bad. I don’t want to erase all these memories from my body because I feel I erase them from my life. I want them to be there and remind me of those moments. I can understand why everyone asks for this soup, it looks delicious. Your photos just have these aromas leaping out my computer screen! Ah! Yay! I am so excited! I never win anything! On another note- this soup looks delicious! Chicken tortilla soup is one of my favorites. Also, I agrees with you about scars- they are a reminder of the past and all we have been thru… The good the bad and the ugly! I have a scar on my face too :) :). Hit by a half a brick on the playground as a kid and needed to get stitches! I hated it growing up, but now I look at it as making me unique :). Sommer the pictures are beautiful !!! I am making this for next week.Thanks!!! Scars are stories to tell! Oh, wow, and that’s quite a story. This soup is a thing of beauty! GORGEOUS photos! 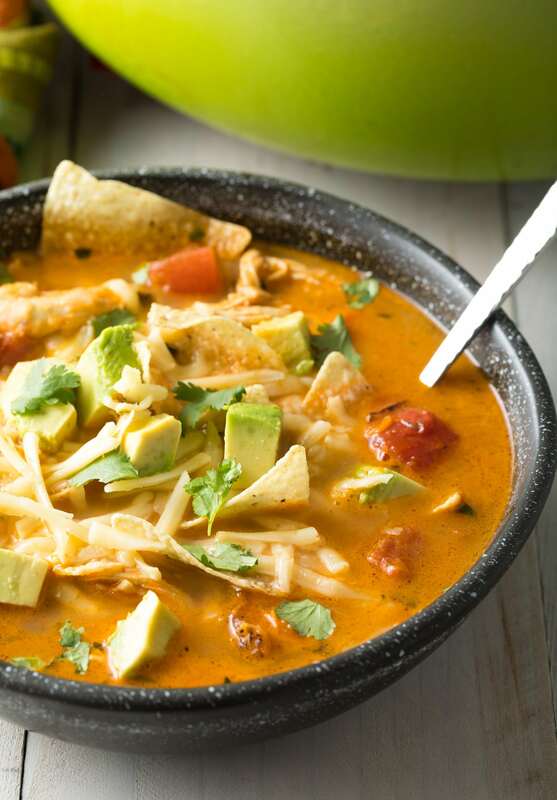 I love chicken tortilla soup- and the avocado is a GREAT addition. I wish the avocados at our local Teeter didn’t taste like cardboard right now! I still love this soup, but better when avs are in season. Lovely. With the avicado and cheese on top, it is simply perfect. Have a wonderful night!